It's a tradition as important as tamales. NORAD is all over Santa thanks to it's North Warning System that can track the man in red via Rudolf's Red Nose. From NoradSanta.org. 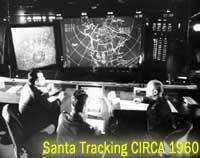 For more than 50 years, NORAD and its predecessor, the Continental Air Defense Command (CONAD) have tracked Santa. The tradition began after a Colorado Springs-based Sears Roebuck & Co. store advertisement for children to call Santa on a special "hotline" included an inadvertently misprinted telephone number. Instead of Santa, the phone number put kids through to the CONAD Commander-in-Chief's operations "hotline." The Director of Operations, Colonel Harry Shoup, received the first "Santa" call on Christmas Eve 1955. Realizing what had happened, Colonel Shoup had his staff check radar data to see if there was any indication of Santa making his way south from the North Pole. Indeed there were signs of Santa and children who called were given an update on Santa's position. Thus, the tradition was born. In 1958, the governments of Canada and the United States created a bi-national air defense command for the North American continent called the North American Air Defense Command, known as NORAD. The third detection system we use is the Santa Cam. We began using it in 1998 - the year we put our Santa Tracking program on the Internet. NORAD Santa Cams are ultra-cool high-tech high-speed digital cameras that are pre-positioned at many places around the world. NORAD only uses these cameras once a year - Christmas Eve. The cameras capture images of Santa and the Reindeer as they make their journey around the world. We immediately download the images on to our web site for people around the world to see. Santa Cams produce both video and still images.